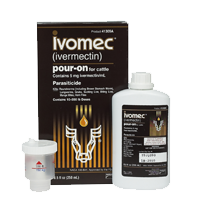 IVOMEC Pour-On applied at the recommended dose level of 500 ?g of ivermectin per kg of body weight is indicated for the treatment of parasitic infections and infestations due to gastrointestinal roundworms, eyeworms, lungworms, grubs, mites and hornflies in cattle. 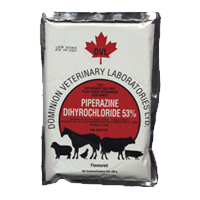 This product is also indicated for the treatment and control of infestations due to sucking and biting lice in cattle. Available in: 2.5 litre or 5 litre jugs. 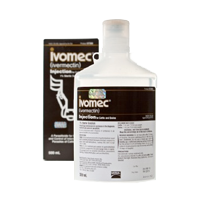 IVOMEC Injection is indicated for the treatment of infections and infestations due to gastrointestinal roundworms, lungworms, grubs, sucking lice and mange mites in cattle. • Sarcoptes scabiei var. bovis; Psoroptes ovis (syn. P. communis var. bovis) *IVOMEC Injection given at the recommended dosage controls infections of Dictyocaulus viviparus, Ostertagia ostertagi and Oesophagostomum radiatum for 21 days after treatment; Haemonchus placei, Trichostrongylus axei, Cooperia punctata and Cooperia oncophora for 14 days after treatment. IVOMEC Injection is indicated for the treatment of infections due to gastrointestinal roundworms, lungworms, and larval stages of the nasal bot in sheep. 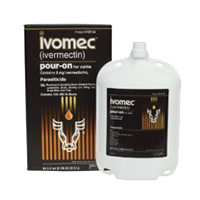 IVOMEC Injection is indicated for the treatment of the following parasitic infections and infestations in swine. 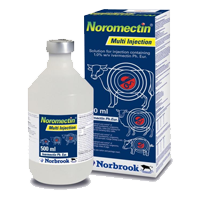 Noromectin Injection is indicated for the treatment of infections and infestations due to gastrointestinal roundworms, lungworms, grubs, sucking lice and mange mites in cattle. • Ostertagia ostertagi (adults and fourth stage larvae including inhibited O. ostertagi); O. lyrata (adults); Haemonchus placei (adults and fourth stage larvae); Trichostrongylus axei (adults and fourth stage larvae); T. colubriformis (adults); Cooperia oncophora (adults and fourth stage larvae); C. punctata (adults); Oesophagostomum radiatum (adults and fourth stage larvae); Strongyloides papillosus (adults). • Dictyocaulus viviparus (adults and fourth stage larvae). • Hypoderma bovis; H. lineatum. • *Noromectin Injection given at the recommended dosage controls infections of Dictyocaulus viviparus, Ostertagia ostertagi and Oesophagostomum radiatum for 21 days after treatment; Haemonchus placei, Trichostrongylus axei, Cooperia punctata and Cooperia oncophora for 14 days after treatment. Noromectin Injection is indicated for the treatment of the following parasitic infections and infestations in swine. • Sarcoptes scabiei var suis. Paste provides effective control of the following parasites in horses. Strongyloides westeri; Summer Sores caused by Habronema and Draschia spp. cutaneous third-stage larvae; Dermatitis caused by neck threadworm microfilariae, Onchocerca sp. EQVALAN GOLD is the broadest-spectrum dewormer available in Canada. 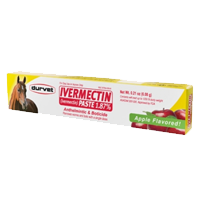 It combines two active ingredients – ivermectin and praziquantel – to provide comprehensive, broad-spectrum parasite control for your horses. EQVALAN GOLD is registered to control 70 species and stages of equine parasites – including tapeworms! That’s more than twice as many as the product you may be using now. * Nothing is more deadly to parasites. 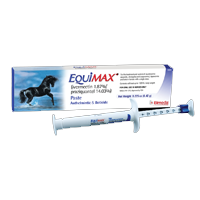 EQUIMAX is the only combination ivermectin/praziquantel dewormer safe for ALL horses, including foals four weeks of age and older, pregnant and lactating mares, and breeding stallions. Safe-Guard (fenbendazole) Paste 10% contains the active anthelmintic, fenbendazole. Each gram of Safe-Guard Paste 10% contains 100 mg of fenbendazole and is flavored with artificial apple-cinnamon liquid. The antiparasitic action of Safe-Guard Paste 10% is believed to be due to the inhibition of energy metabolism in the parasite. 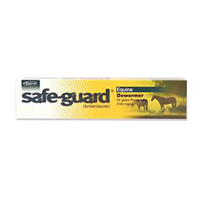 Safe-Guard Paste 10% is indicated for the control of large strongyles (Strongylus edentatus, S. equinus, S. vulgaris), encysted early third stage (hypobiotic), late third stage and fourth stage cyathostome larvae, small strongyles, pinworms (Oxyuris equi), ascarids (Parascaris equorum), and arteritis caused by fourth stage larvae of Stongylus vulgaris in horses. Safe-Guard Paste 10% is approved for use concomitantly with an approved form of trichlorfon. Trichlorfon is approved for the treatment of stomach bots (Gasterophilus spp.) in horses. Refer to the manufacturer’s label for directions for use and cautions for trichlorfon. Quest Gel Moxidectin provides horse owners worldwide with effective control against a broad spectrum of internal parasites, including bots. Quest delays reappearance of strongyle eggs for 84 days, permits parasite and bot control with only four treatments per year, is the only dewormer that kills small strongyles in the encysted state with a single dose, and is formulated as an easy-to-use, clear gel that offers less mess and less stress on horses and their owners. This product should be given to foals, ponies, and miniature horses with caution because overdose can lead to serious reactions. Combines 2% moxidectin and 12.5% praziquantel for the treatment and control of large and small strongyles, encysted cyathostomes, ascarids, pinworms, hairworms, large mouth stomach worms, stomach bots and tapeworms. One dose also suppresses strongyle egg production through 84 days. May be used in horses and ponies 6 months of age and older. Testing has not been done in breeding mares or stallions. Each sure-dial syringe is calibrated in 50 lb. increments, and treats up to 1,150 lbs. body weight. 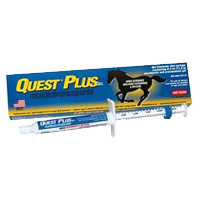 QUEST PLUS (moxidectin/praziquantel) Equine Oral Gel when administered at the recommended dose level of 0.4 mg moxidectin/kg and 2.5 mg praziquantel/kg (2.2 lb) body weight is effective in the treatment and control of the following stages of gastrointestinal parasites in horses and ponies: Large Strongyles, Small Strongyles, Encysted cyathostomes, Ascarids, Pinworms, Hairworms, Large-mouth stomach worms, Horse stomach bots, Tapeworms. One administration of the recommended dose rate of QUEST PLUS (moxidectin/praziquantel) Equine Oral Gel also suppresses strongyle egg production through 84 days. 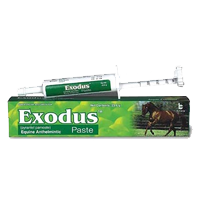 Exodus Paste (pyrantel pamoate) is a pale yellow to buff paste containing 43.9% w/w pyrantel pamoate in an inert vehicle. Each syringe contains 3.6 grams pyrantel base in 23.6 grams paste. Each milliliter contains 171 milligrams pyrantel base as pyrantel pamoate. For the removal and control of mature infections of large strongyles (Strongylus vulgaris, S. edentatus, S. equinus); small strongyles; pinworms (Oxyuris equi); and large roundworms (Parascaris equorum) in horses and ponies..
Our soluble form of flavored piperazine powder is indicated for use as a one day wormer for control of round worms in poultry, swine, and horses. It will also control nodular worms in swine, and small strongyles in horses.